We reach a Balancing place on Tone 7 compared to the top of the pyramid. Through a climb of Spiritual Growth we were given all the experiences we need for the Wisdom of a New Transformation. Road/EB is the Day Sign also known as Human. EB is the Road of Human’s Destiny. 7 is the Tone of Reflection. We can look back on all the experiences of this trecena to explore what we were intended to learn, and how it could Change our Life in the Future. The Road/EB glyph illustrates the Road of our Destiny on Human’s Head. On either side of the road are the Major Milestones of Wisdom. Our Destination is the result of the Choices we make of our own Free Will. CIMI’s gift of clairvoyance is shared with us to see where Choices of Love and Beauty would lead us. 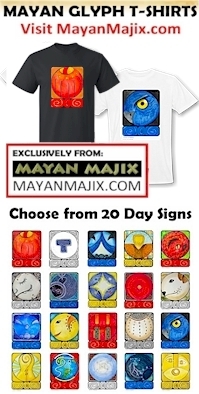 The Cherokee Day Sign, Rattlesnake Tooth, is a sign of Divine Healing that leaves a mark. The Rattlesnake Tooth is a symbol of the Ethereal Light of a Rainbow. 7 Road/EB (Kin 72) is a Portal Day that represents a thinning of the veil. Portals magnify our Supernatural Senses and expand our awareness of the Dimension of Spirit. Portals open the channel to our Spiritual Gifts of Intuition and Knowing. Under the Day Sign CIMI, a portal is open to help us see into our future. Under the Year Bearer of 5 Wind/IK, we are navigating the Winds of Change. Under the Tone 5 of Empowerment, we are guided to a Destination of New Life that was planned by a Creator who Spoke the world into creation from the Breath of Life and Spirit. Years led by Wind/IK mark times of significant change when, like Wind, the direction of our lives can quickly change. 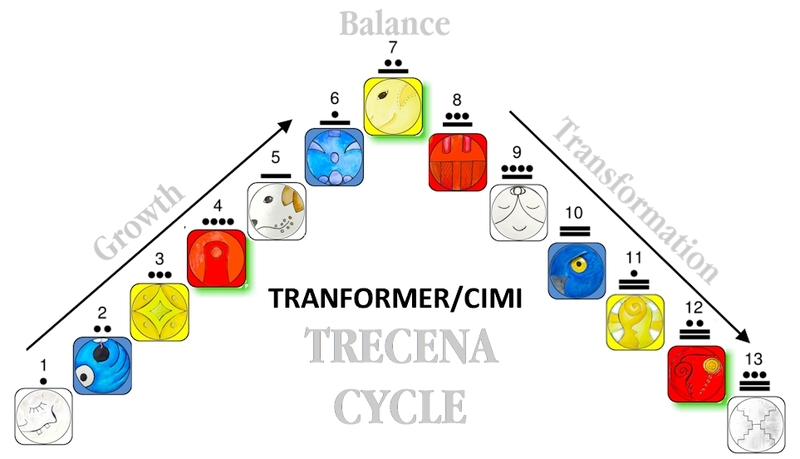 CIMI is a trecena of Change existing in the 4th Uinal (Higher Intention) of Stability. We can establish our Spiritual orientation on the Truth that Change is a Perpetual part of our Human experience. Sometimes we find ourselves at the end of the Road, feeling that the circumstances of today are the way things will always be. Through reason and imagination, we can project the destination that the Creator would have in store. So far in this round of the Tzolk’in, we have been offered the Higher Consciousness to see that we were created to serve as the Hand of God. As we follow this path, our understanding of God is elevated by firsthand experience. Our Divine Destiny is the Service we provide to the Creator. Human was created for the purpose of relationship. Human was created to share the experiences of a physical world. When we are Atoned with the Creator, we can become God’s experience of the world. We are amplified Receivers, sharing the Divine Experience of living from Earth to the Heavenly realm. Every thing in the world contains this Spark of Life, recognizable as matter in motion. Our whole world lives in the Consciousness of the Creator. When we look for Beauty and Love we will always find it. The only thing different between Human and everything else, is the Free Will to Choose what we Experience. Our Divine Calling is the choose the experiences that were planned by the Creator. God created the world to experience it Himself. We fulfill a Divine Purpose in sharing all the experiences of Human, so that we might see the Beauty in comparison to the Holy experiences of God. Through the Choice to be of the same mind as the Creator, God exists in the Center of our Universe. With God in the Center our lives become a Divine Experience. The World was created for Experience. A Creator intended us to know more than just the experience of being Human. We were also created to know the Experience of God through Spirit. Atoned with the Creator, we become God’s Divine Experience of the world. Human would see beyond its own Hand reaching up, to the Hand that reaches down. Most of our changes are incremental, so subtle we wouldn’t notice unless we were paying attention. Offering Equality to the Whole, the Creator’s small changes where meant to serve a dual purpose. Over time they generate a Major Life change that is apparent for all to see. These are the changes we see in the Seasons, and in the Year of 5 Wind/IK, an Empowerment by the Winds of Change. The head is the Central Station for all our Senses of Consciousness. Our face is the most recognizable evidence of Who We Are. The head bears the Crown of our Divine Identity. The hats we wear can altar our identity or symbolize our authority. The biblical accounting of the Armor of God urges Human to put on the Helmet of Salvation. People who have faced near-death, often report that it was a beginning of living life in a new way. They realize the Divine Destiny that life is worth living for. When we Know a Creator of Unconditional Love, we can Live for the Celebration that’s been prepared for a Divine Homecoming. The helmet we wear on Earth, in Heaven will become our Crown. To all my relations, may we reflect on all the experience that brought us to this place. May we recognize how carefully the steps were offered by the Creator that would lead us to our Divine Destiny. May we see that every step we take in Faith is worthy because we Choose it. May we identify ourselves by our final destination, and by our Creator who prepared the journey. May we mark this place as an important milestone on the way, cherishing all the opportunities we were given to experience Love and Beauty. May we seek out those experiences of life that create the Hymn of Harmony and Equity that were the birthright of a Divine Creator. May we remember the Rainbow and the Promise of our Spiritual Destination, living in the Faith of a New Tomorrow.